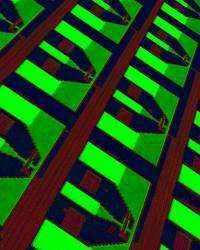 Optical microscope photographic image of an array of nanophotonic avalanche photodetectors on a silicon chip. (PhysOrg.com) -- IBM scientists today unveiled a significant step towards replacing electrical signals that communicate via copper wires between computer chips with tiny silicon circuits that communicate using pulses of light. As reported in the recent issue of the scientific journal Nature, this is an important advancement in changing the way computer chips talk to each other. More information: The report of this work, entitled “Reinventing Germanium Avalanche Photodetector for Nanophotonic On-chip Optical Interconnects,” by Solomon Assefa, Fengnian Xia, and Yurii Vlasov of IBM’s T.J. Watson Research Center in Yorktown Heights, N.Y. is published in the March 2010 issue of the scientific journal Nature. IBM's new Power 5 chips based on SOI and copper interconnects. “This invention brings the vision of on-chip optical interconnections much closer to reality,” said Dr. T.C. Chen, vice president, Science and Technology, IBM Research. So it's not yet a reality. I think by 5 years they have it commercially ready. The timescale of siliciumchip technology is almost over. By 2015 we are at the 11nm node. By then new technology will appear like optical chips and after that quantum chips.